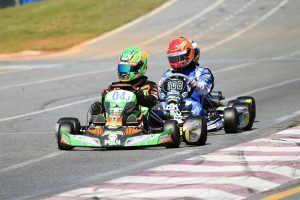 The United States Pro Kart Series began its fifth season last month when the program visited the GoPro Motorplex circuit. It was the fourth time the championship opened up at the Mooresville, North Carolina facility, welcoming great weather for the first time for an April visit. 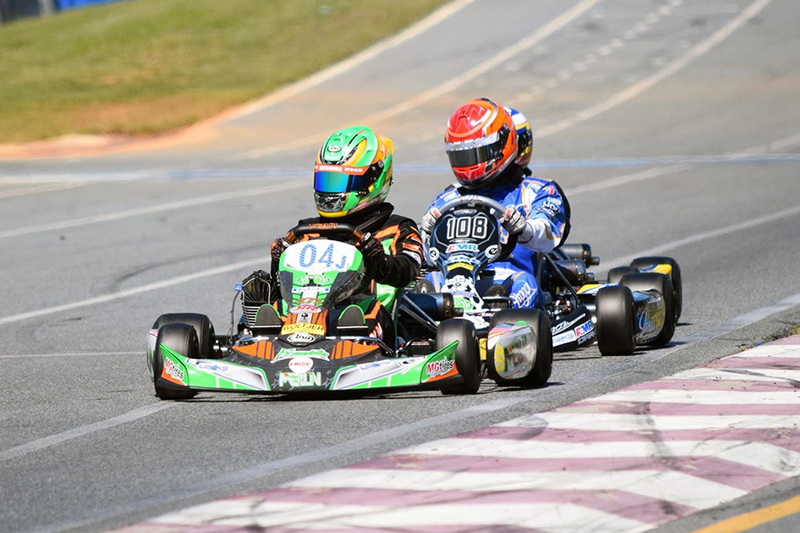 The Carolina Grand Prix was the debut of two major items for United States karting. One, the series implemented the ‘pushback’ bumpers on all karts to help eliminate rough driving. And second, the debut of the IAME KA100 engine platform. 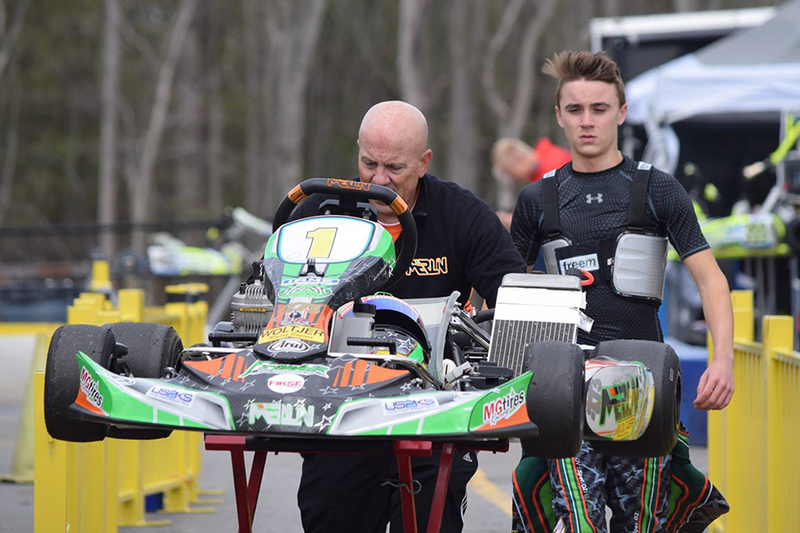 Twenty-seven drivers made the debut weekend for the KA100 category with United States Pro Kart Series, including Alex Bertagnoli. 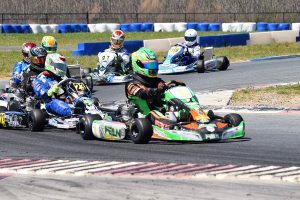 The Senior rookie, who claimed both IAME Junior and Yamaha Junior titles at USPKS along with the SKUSA Pro Tour Junior title, qualified fourth to open up the Saturday round of racing. Bertagnoli drove up to second in the first 15-lap heat race, before leading part of the second heat, eventually ending up in the second position. Alex was shuffled back to fourth early in the lead pack but worked his way up to fight for the top spot against top qualifier and heat winner Brandon Jarsocrak along with former national level driver Dusty Davis. Bertagnoli secured the lead with three laps remaining, holding on to cross the line first and put his name in the record books as the first USPKS KA100 victor. The win was also his first as a Senior driver. On the same day, the 15-year-old recorded a second victory, claiming the opening round of the IAME Pro division. Alex was in the mix right away, posting the second quickest lap of the qualifying session, missing out on the fast time by just 89 thousandths of a second. Bertagnoli ran second and third in the two 15-lap heat races, lining up on the outside of row one for the 20-lap main event. A rough opening circuit put Alex down to seventh in the order with work to do. Lap after lap, Bertganoli inched his way closer to the top spot. With five laps remaining, Alex put himself into second behind Jarsocrak. The Franklin Motorsport / Merlin driver took the lead away on the final circuit, crossing the line first to claim victory. Bertagnoli added two runner-up finishes on Sunday, placing second to Dusty Davis in KA100 and just behind Jarsocrak in IAME Pro. Alex holds the championship lead in the KA100 category by eight points over Jarsocrak, while the two swap positions in the IAME Pro standings with Bertagnoli trailing by 21 points. Along with the USPKS program, Bertagnoli is carrying the #1 SKUSA graduation plate after earning the X30 Junior title in 2016. The opening two events on the SKUSA Pro Tour have been rough with issues at NOLA and Sonoma, with Alex looking to turn it around at New Castle in August. You may also see the Illinois driver at some of the Route 66 Sprint Series events this summer.